Craving something sweet? Try this 15-minute recipe Coconut Barfi – a perfect recipe for when you want something sweet and satisfying without spending hours in the kitchen. Coconut Barfi or Nariyal Barfi is a soft and delicious barfi or fudge which has freshly grated coconut and sugar as its main ingredients. Coconut barfi is usually made by adding grated coconut to a one-string consistency sugar syrup mixture and cooking them together. In the last two decades or so, condensed milk has been included in this recipe as well. In my opinion, the sugar syrup, as well as the condensed milk, lends the Coconut Barfi a slightly chewy texture. 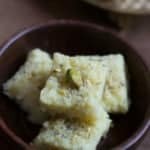 This Coconut barfi recipe (adapted from Sanjeev Kapoor’s website) uses cream instead of condensed milk or sugar syrup. 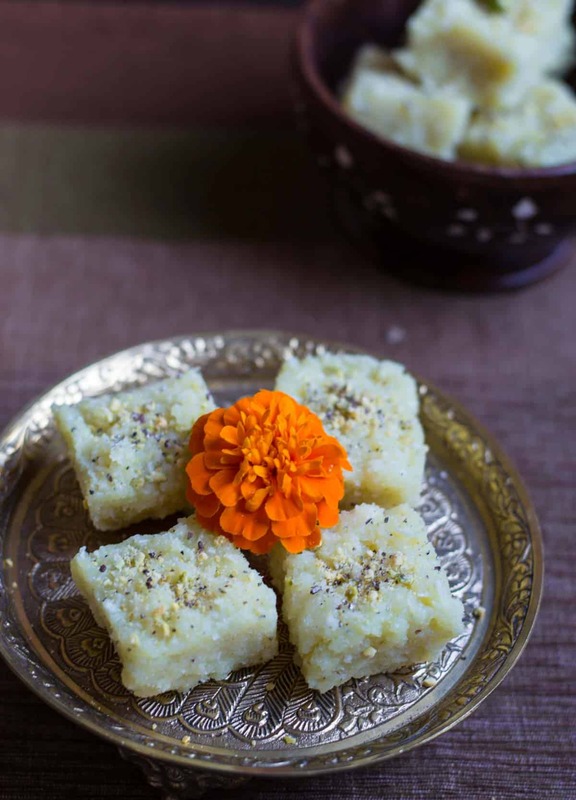 The introduction of cream makes this barfi soft and very easy to dig into – perfect for kids. Using cream instead of sugar syrup also cuts the cooking time drastically. If you loved this recipe, I am sure you will love Wheat laddoo and Besan Laddoo as well. Check them out! Craving something sweet? Try this 15-minute recipe Coconut Barfi - a perfect recipe for when you want something sweet and satisfying without spending hours in the kitchen. Heat a non-stick kadhai over medium-low and add grated coconut, sugar, and cream. Mix them well till they are well combined. Continue to cook them while stirring continuously till the mixture turns yellowish golden in color and starts leaving the sides of the kadhai like in this picture. Remove the kadhai from heat and add cardamom powder and confectioners sugar and mix well. Grease a thali or a 9-inch square pan with ghee. Pour the mixture into the greased pan and spread it evenly. 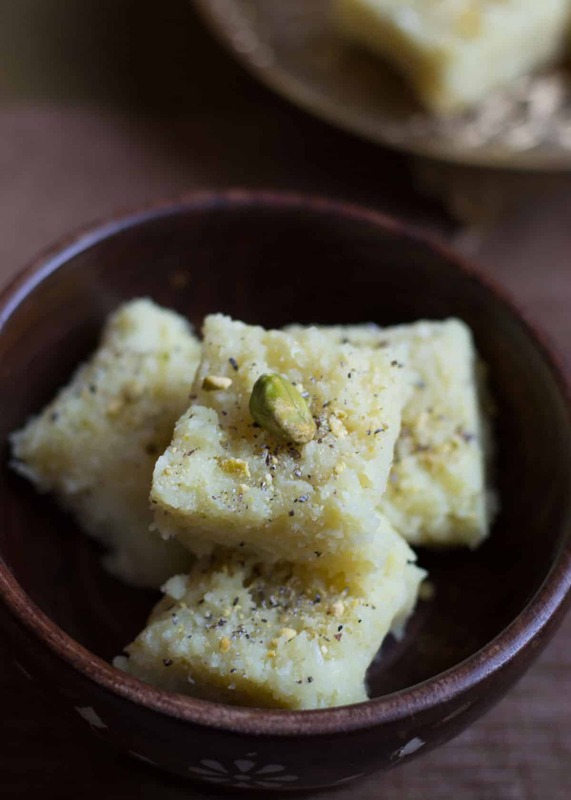 Sprinkle finely chopped pistachios (if using) and let the coconut barfi set for an hour or so in the refrigerator. Slice the barfi into sixteen equal pieces. Affiliate Disclosure: I am grateful to be of service and bring you content free of charge. To do this, some of the links on this post are affiliate links, which means that I may earn a commission if you click on the link or make a purchase using the link. I only recommend products that I use and love myself, so I know you’ll be in good hands. Your support in purchasing through these links goes towards maintaining this website. Thank you! Hi Anu..Very easy method for coconut barfi..
Bt can I take dry coconut instead of fresh grated coconut?…And what will be difference in that method or taste?.. 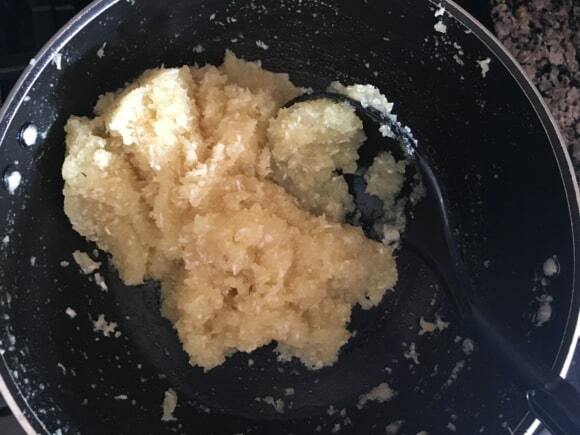 Megha – I haven’t tried with dry coconut but the recipe should work with it as well without impacting the taste to a huge extent. Good luck!